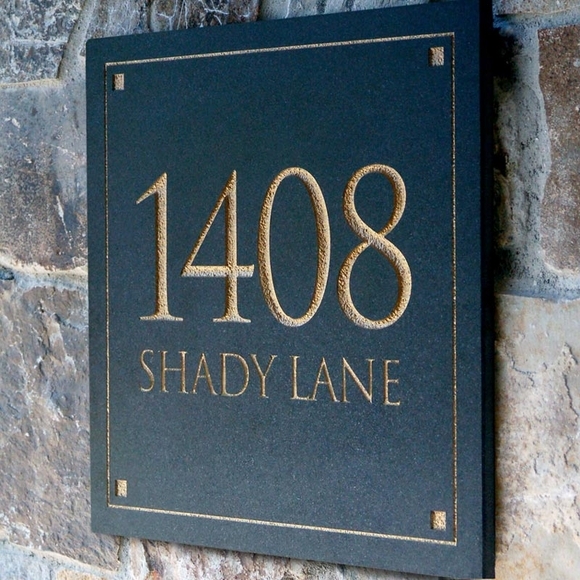 Engraved Stone Address Plaque - - personalized with your house number. Square wall-mount address sign holds up to six house numbers. Made in USA. The address is first carved into the stone and then painted. Made from 3/8" thick stone with a honed face. A thin ribbon border and corner accents define the square shape. Holds one or two lines of personalization. Character size varies depending on configuration. Line 1 holds one, two, or three 5" numbers; four 4" numbers; five 3.25" numbers; or six 2.75" numbers. Optional Line 2 holds a thirteen (13) character street name. If you do not want a street name, please leave the Line 2 input box empty. Two distinctive fonts: futura (shown in large image and first three small images) and trajan (click small image on the right to enlarge). Dimensions: 12"W x 12"H x .375"D.
Includes mounting pin on the back. You will also need construction adhesive. Personalized and custom made for you. Engraved and painted stone home address sign personalized just for you.